Eurocom Corporation, a leader in the Desktop Replacement notebook technology since 1989, has launched today its first notebook built upon the revolutionary new Intel Core Duo processor and ATi Mobility Radeon X1800XT VGA with 256 MB of DDR3 VRAM for super fast graphics performance. The new EUROCOM M570U Divine notebook featuring a 17-inch widescreen display and full-size desktop-like keyboard is designed for high-performance professional computing, gaming, movies, digital photography, and home video editing. The EUROCOM M570U Divine sporting a large 17-inch Widescreen display with WUXGA 1920-by-1200 pixels resolution and Clear Glossy Surface with 16:9 Aspect Ratio, is the first EUROCOM notebook built upon the revolutionary new Intel Core Duo, which is actually two processors (up to 2.26 GHz) engineered onto a single chip. It provides 2MB of Smart Cache, L2 cache that can be shared between both cores as needed. 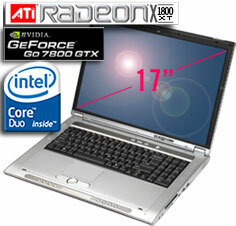 It delivers higher performance in 2D and 3D graphics, video editing, and music encoding. The new model has a frontside bus and memory at 667 MHz, as well as 16x PCI Express, and a Serial ATA hard drive up to 160 GB. The secondary removable bay can take a second physical hard drive, a second optical drive or a secondary battery pack. The primary optical drive features a Multi DVD Burner, which supports both +-RW and -RAM formats. Gaming enthusiasts and graphic designers will discover new levels of super fast performance with ATi Mobility Radeon X1800XT VGA with 256MB of DDR3 VRAM. The new ATI X1800 XT card offers users: Avivo technology for HD video and display perfection, high dynamic range rendering with Anti-Aliasing, Parallax Occlusion Mapping, Volumetric Lighting, Ultra-threaded architecture, RingBus memory Controller and full support for catalyst Mobility. Designed for high-performance professional computing, gaming, movies, digital photography, and home video editing, the new M570U notebook delivers an ultra-smooth game play and digital media experience. The new M570U model comes equipped with a desktop-like full-size 102-key keyboard with a separate numeric keypad for ease of typing and integrated WebCam for video conferencing. The system measures 397 x 294 x22-44 mm and weights 3.8 kg. Eurocom offers 1 year standard warranty and optional 3 years Return to Factory and On-Site warranty. The system is scheduled to be shipped in April 2006.